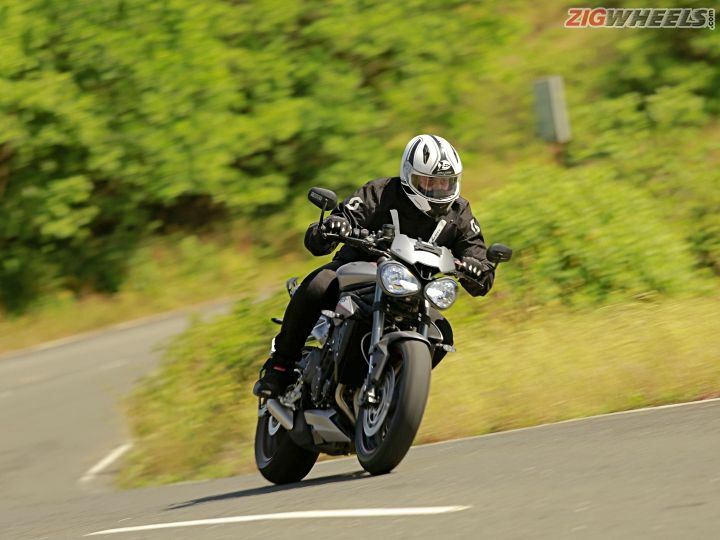 When the Triumph Street Triple S made its way to India, we were quite thrilled to see that Triumph had changed the Street Triple 675’s formula to iron out any shortcomings that lingered. This meant an increase in power and addition of more electronic aids. Sadly though, and crucially in our books, the S missed out on its predecessor’s divine handling. But that was Triumph’s first salvo with the more powerful Street Triple and the subtly different RS was still to come. We’ll admit, we have sky-high expectations from anything wearing a Street Triple badge. So, after our ride, we were expecting to wear wider grins and reserve even more respect for the family. Did the RS do it? Visually, the Triumph Street Triple RS has received only subtle updates instead of a full-fledged overhaul over the 675. These include the reprofiled bug-eyed headlamps, which, thanks to the bright LED DRLs, are a lot easier on the eyes. Nighttime visibility from the bug-eyed headlamps is excellent and so is the visibility from the bar-end rearview mirrors, which don’t vibrate even while accelerating hard. The relatively flat and low-slung handlebar is positioned to offer a sporty and involving ride posture, but it isn’t cumbersome while doing long stints either. Furthermore, the matte grey paint scheme with a dash of red and ‘RS’ badging on the minimalistic tank extensions give it the identity to stand out from the S variant. We also liked the premium-feeling split seats stitched in white. Overall, these finer details give it a sharper and edgier look. Apart from the LED DRLs and the matte grey paint scheme not much has changed on the design front. This could work either in favour of the bike or not, as styling is a subjective matter. That said, one major and certainly one of the most attractive updates that the RS has received is the five-inch TFT display that swivels (first in the segment) and comes with an auto contrast feature. Functions and settings can be changed via the 5-axis joystick placed on the left switchgear, which also helps toggle between 6 display modes. Other useful information displayed include ride modes, ambient temperature, fuel gauge, fuel range, service reminder, lap timer and a lot more. In fact, information provided to the rider and the operation of the TFT screen is so well defined that even a first-time rider will be able to pick up the operation fairly quickly. Apart from the joystick, the left switchgear houses the horn, indicator, headlamp on/off switch and a high/low beam light switch, which also acts as a pass light switch when only the DRLs are running. The right switchgear, on the other hand, consists of a hazard light indicator, a home screen button and the starter button. Switchgear quality is top notch, and despite the additional switches on offer, they are well laid out, with all the switches working with a nice and soft click. Build quality and paint finish are also on par with the best in the segment. The RS which we have here is the fully loaded beast that generates 123PS at 11,700rpm, while 77 Nm of peak torque is generated at 10,800rpm. In comparison, it’s 10PS more powerful and 4 Nm torquier than the S variant. Mated to a six-speed gearbox, power is transferred to the rear wheel via a bidirectional quick shifter which is calibrated to provide flawless upshifts. Downshifting, however, is smoother when you are riding hard. After just a few minutes, it was obvious that the state of tune of 765cc motor on the RS is undoubtedly the state of tune that it was designed for. Sweet and smooth, lusty and punchy. Therwereas none of the low-rpm chuggings we experienced on the S. Also, even though the gearing is the same, the RS just feels a lot more responsive and requires fewer gearshifts. The gear ratios on the RS are the same as the S but with 4 Nm more torque available from the bottom end, the motor proves to be a lot more tractable in city riding conditions. As a result, in 3rd gear, the Street Triple RS managed the 30-70kmph stint in 2.63 seconds, while 40-80kmph in 4th gear is manageable in 3.15 seconds. The super-light clutch further sweetens the ride time in the city. Heat dissipation is also a lot better than the 675. The fairly short turning radius further helps tackle traffic fairly easily. What of the braap-bravo mode? The 0-100kmph run on the RS is on par with Street Triple S i.e. 3.59 seconds. The beast truly comes to life past 7500rpm, where it feels most lively, barely taking time to hit the redline indicated at 12,750rpm. As a result, the RS, at 7.19 seconds, proves to be almost 0.7 seconds faster in reaching the 160kmph mark when compared to the S. In fact, the rush of power is so aggressive at the top that we had the front wheel lifting off on most of our runs. It’s clear that there is a deeper and more serious edge to the Triple’s performance now. That’s not all, you’ll be happy to know that the engine note and induction sound is also significantly louder and deeper than the 675. An aftermarket exhaust is no longer a necessity! While we tested the bike in Track mode, the company offers five riding modes to choose from - Rain, Road, Sport, Track and Rider, which can be changed on the go. Mode selection doesn’t change the power output; instead, the throttle response, traction control and ABS level are altered to better suit the riding conditions. In Rider mode though, riders can manually configure the throttle response, traction control and ABS to their prefered riding style, for which the bike has to be stationary. Okay, it’s a sure thing, with the RS the Street Triple is well and truly back in spirit. Hallelujah! Skip the rest of this para if you don’t like numbers. But it’s interesting to see how Triumph has crafted this family. Both the Street Triple S and the RS still use the aluminium beam twin-spar frame seen on the 675 but the steering geometry of the latter has been altered. Initially, the 675 showcased a rake of 24.1 degrees and a trail of 99.5mm, which played a part in its sublime handling dynamics. The rake angle on the RS is now reduced to 23.9 degrees, while the rake on the S has been increased to 24.8 degrees. While these changes don't seem to be much on paper, they have a significant impact on the handling characteristics of the two bikes. For starters, the Street Triple S’ front-end requires a hint of effort while changing direction, and this is not only felt on the twisties but also in city traffic. However, it’s not that the S isn’t a good handler, it’s just that it doesn’t feel as fluid as the RS does. The shorter rake and trail (compared to the Street Triple S) endow the RS with the magic we were yearning for. Entering a corner maintaining the line and transitioning on to the next corner is a very fluid experience as the bike is very responsive to rider inputs. The Pirelli Diablo Super Corsa tyres further strengthen the rider’s ability to push the bike harder with every bend. The two 765 variants are also two kg lighter than the old Street Triple and tip the scales at 186kg (kerb), which makes them lighter to handle. To say the least, the Street Triple RS can be best described as a magical motorcycle that can be intuitive, accurate, fierce and forgiving. Bless you. Thanks to the slightly rear-set raised footrests and the ample amount of legroom on offer for even 6-feet tall riders, this track-focused bike comes across as a comfortable bike to not only ride around town but also put some serious miles on the odo -- that too without much stopping. The plush-feeling rider seat with just the right amount of padding further aids to the comfort. The 825mm seat height also means that the RS is accessible to most riders. There is not much room for the pillion though. The fully adjustable front Showa suspension and Ohlins shock at the rear are set up on the firmer side, and yes, you will feel almost every other bump you tackle, but it’s not something that would upset you or unsettle the bike. The S is surely the more pliant motorcycle. For braking, the Street Triple RS is endowed with mighty Brembo M50 brakes upfront that manage to drag down the digits on the display and bring the bike to a standstill from 100kmph in 42.45 metres, which is reassuring indeed. The feel from the lever is all the more impressive. The tractable nature of the engine is also apparent from the fuel figures we received. The Street Triple RS returned an impressive 21.48kmpl in the city and 23kmpl on the highway, which is considerably higher than the Triple S, which returned 16.23kmpl in the city and 21.48kmpl on the highway. So, is the Street Triple in its best avatar yet? Most importantly, has the magic returned? Definitely! In fact, we are willing to go out on a limb and say that the Street Triple RS is also a worthy contender for the best all-in-one road bike ever produced. The reason for this is quite simple – it's a bike that does everything that a rider desires. It's good at handling city commutes. It will thrill you on those weekend ride to the twisties with your mates. The quick-shifter, slipper clutch and the Brembos transform it into a force to reckon with as you charge on to apexes on the racetrack. Furthermore, the electronics package and large TFT display give it the modern flair and to top it all, the fit-finish and the detailing ooze quality. Let's just say that the 765 RS is all we ever wanted a Street Triple to be. So, if there is just one bike you can have and do almost everything, we most certainly recommend the Street Triple RS.